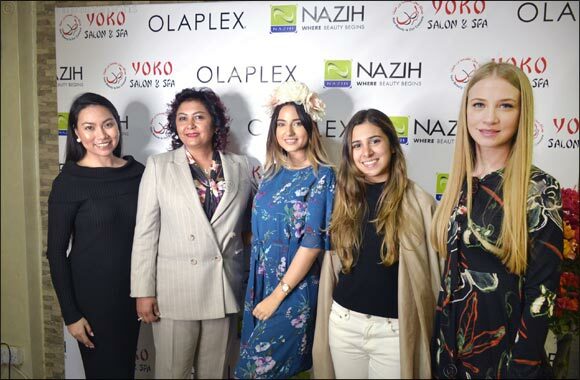 Dubai, UAE, March 31, 2019: Nazih Cosmetics, a total beauty product supplier and the undisputed hair and beauty expert in the MENA region, has launched OLAPLEX®, a revolutionary hair care product range that results in the softest, shiniest, and healthiest hair imaginable. The media launch was held on Wednesday 28th March 2019 at Yoko Salon in Ajman. Made in California, OLAPLEX® features a simple in-salon three-step process which includes a patented active ingredient that works on a molecular level to seek out broken bonds in the hair that are caused by chemical, thermal, and mechanical damage. Backed by real science with real proven results, OLAPLEX® restores compromised hair into healthy strands again. It can be added to salon treatments to provide the ultimate breakage insurance. OLAPLEX® is a single active ingredient invented by Dr. Eric Pressly and Dr. Craig Hawker. Technically named Bis-Aminopropyl Diglycol Dimaleate, OLAPLEX® works by reconnecting broken disulfide sulfur bonds in damaged hair. The product range tackles the most common hair issues, such as dry and frizzy hair, caused by the environment by restoring internal strength and hydrating the hair follicles. Women are left with strong shiny hair that looks and feels healthy. The whole range includes N°1 Bond Multiplier® that is the beginning of the rebuilding process. This is doing in salon in order to rebuild broken disulfide bonds and begins the process of preventing damage and repairing hair. N°2 Bond Perfector® is pursuing hair perfection. This important salon continues to rebuild and restore any remaining broken bonds ensuring the strongest, shiniest, and healthiest hair possible. Hair expert’s advice women to be gentle with their hair when styling mechanically or brushing. Always detangle from the ends of the hair up. It is recommended to detangle damp hair with OLAPLEX® N°2 for a creamy smooth finish and to mitigate any damage done during the detangling process. N°3 Hair Perfector also repairs, protects, and strengthens hair. N°3 is not a conditioner, it’s an at-home treatment that reduces breakage and visibly strengthens hair, improving its look and feel. N°4 Bond Maintenance™ the Shampoo is an essential part of the process repairs bonds while gently cleansing all types of hair. It also imparts moisture, strength, and manageability with every wash.
N°5 Bond Maintenance™ Conditioner can be done at home. It restores, repairs, and hydrates without adding excess weight and eliminates damaged frizz for strong, healthy, shiny hair. In this regard, Olaplex 1,2,3,4 and 5 can be considered an integrated regimen. Olaplex NO.6 Bond smoother is a leave-in reparative styling crème. It can be an at-home treatment and acts a leave-in reparative styling creme which eliminates frizz, hydrates, and protects all hair types. Famous celebrities such as Kim Kardashian, Miley Cyrus, Ruby Rose, Rita Ora, Drew Barrymore, Charlize Theron, Jessica Biel, Mariah Carey, Jennifer Aniston and Gwyneth Paltrow, amongst others, have entrusted their precious locks to the care of their trusted hairdressers who use the OLAPLEX® range to take care of the integrity of their hair while undergoing various chemical treatments such as constant dyeing, colouring, straightening, and blow-drying. To ensure that hair remains healthy from inside out, a healthy scalp is a must. With the continuous use of OLAPLEX® N°4 Shampoo and N°5 Conditioner which contain ingredients such as acetic acid, rosemary leaf extract, biotin, oregano extract, burdock root extract, and sodium hyaluronate, a clean and dandruff-free scalp can be achieved. These ingredients aid in issues such as clarifying the scalp to retard flakiness and in fostering scalp health and hair growth. With modern hairstyles such as platinum blonde, rose gold hues to bright pinks, there’s something for every blushing fashion color lover. With OLAPLEX®, colorists around the world are able to push the envelope with confidence knowing they’re putting the integrity of their clients’ hair front and center while providing them with their hair goals from pixie cuts to ombre and balayage. OLAPLEX® Ambassador Justin Anderson has been coloring Miley Cyrus’ hair for years and says: “Miley is the best example of not over doing the hair color or styling to get that healthy length.” Justin uses OLAPLEX® in every formula for his clients to ensure his work is the best it could possibly be, both vibrant and strong.